Chicken and Stuffing cooked in the Crock Pot (or your favorite slow cooker) is a great way to free the oven and your time. What do you do with all the leftover dressing/stuffing you have from the feast you cooked yesterday? Make stuffing bites, of course! 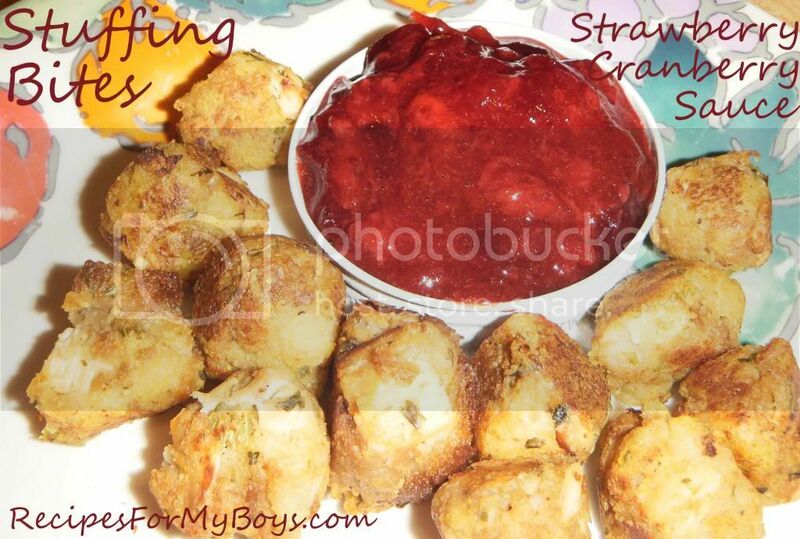 You don't even had to wait for leftovers..just mix a box or bag of stuffing according to directions, add whatever you want to it, form into a shape, pan fry or bake. There you go..simple and perfect! Great for watching the game, as appetizers for your guest, or just popping in your mouth while wrapping presents! Enjoy! Form leftover dressing/stuffing into shapes. Spray skillet with non stick spray. Brown bites on all sides. Serve with Strawberry Cranberry Sauce or cranberry sauce. Enjoy!